Read and share your Foxhole Father stories. Read my blog posts below for daily advice. 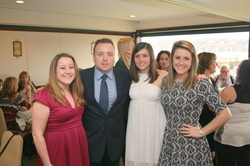 Since 1997, I have bee﻿n a single father to three daughters. My daughters were six, five, and three years old at the time of the divorce. My children’s mother had been a stay-at-home mom, and I was out of the home every day trying to build my business to support us. I voluntarily had taken the steps to divorce. In my heart, I knew these difficult steps were the best thing for all of us. Removing the children from the home and life they knew was a tough decision, but in the long run, the life they deserved lay elsewhere. That “elsewhere” was not a fully formed vision in my mind, but my gut told me that staying married could hurt them emotionally in the long run. I knew that getting divorced would allow me to become the father my daughters deserved. This would allow their mother and me to create separate homes that truly reflected our parenting styles. Then suddenly, it became a reality. I was parenting these three precious lives on my own in our new home. I had planned to continue and expand upon my fathering philosophies that I’d used since my first child was born. This book is the culmination of my day-to-day fathering experiences since 1990. My advice is direct, clear, and never sugar-coated. I always found the best parenting advice was given to me this way, so I have given it to you the same way here. This is not a flowery how-to book. This book is a field manual for all fathers, regardless of their marital status or children's ages. Why Foxhole Father? That is the only way I can find to describe how I felt when suddenly parenting my daughters on my own. My fathering mentality became exactly that. I had always been a fully participating parent when I was married, but I became truly hyperaware and hypervigilant about my fathering role the moment I became a single father. I believe my daughters have benefited from this Foxhole Father mindset. The night I officially moved us into our own apartment—March 16, 1997—was the night I became the Foxhole Father. I was thirty-one years old and lying in a strange bed at 2:00 a.m. I had never lived alone. My three daughters, all under age seven, were quietly sleeping in their new bedroom for the first time. I had spent the day with my daughters and my friends, moving us out of my marital home. All day I maintained my happy facade, but now I lay in bed crying, hyperventilating and shaking uncontrollably. If I hadn’t buried my face in a pillow, my uncontrollable sobbing would have woken my children. What if they walked in my bedroom? What kind of emotional damage could have been inflicted on my daughters had they seen me like that? What if they saw the reality of the emotional wreck their father had become? Three beautiful children in the next room, and I was completely responsible for them for the first time. I sat on the edge of my bed, unable to breathe. I had never had an anxiety attack at this level before. My tears were streaming down my face, and I was gasping for air. I tried to stand up, and the room started to spin. My eyes were open, but a deep blackness slowly filled my vision. I fell into the wall headfirst and was unconscious before I hit the floor. When I came to, I couldn’t move. I was on my back and still couldn't see. For three hours, my shaking, crying, and hyperventilating went on. I did my best to not wake my kids. There would be many more nights like this, alone, in the dark, trying to conceal my sorrow and fear from them, my mouth pressed hard into a pillow. At the end of that first night, the first rays of the sunrise entered my pitch-black room. At that moment, a clear and deep vision came to me. All of my fears were suddenly crystallized into one fathering mission: to put my children’s needs and feelings first and to remove my needs and feelings from my parenting. I had always thought I was putting their needs before mine, but my vision went much deeper than that. This books shares that fathering vision with you. My children are fully functioning adults now. They are flourishing in all areas of their lives. 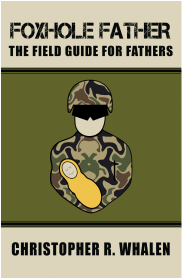 I hope the fathering tools and philosophies I've shared in Foxhole Father will be of benefit to your family. Daddy We Want a Puppy!